Remember this post about the man who tried drunkenly to resuscitate a dead possum? And how I said there should be at least an animated superhero named Awesum Possum? And then reader Rick made me this? WEIRTON – A bluegrass show to benefit the Weirton Lions club community projects will be held at 3 p.m. Oct. 2 at Starvaggi Park, 135 Starvaggi Drive. Bands include Remington Ryde, Lonesome Heart and Awesome Possum. 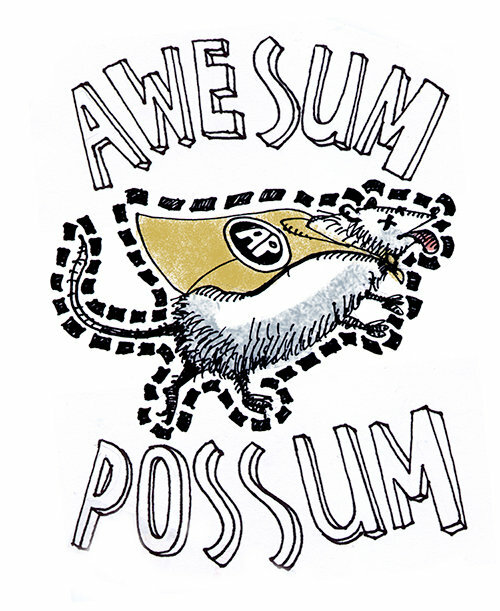 Awesome Possum’s people need to call reader Rick’s people and get some shirts made. Also, we haven’t had any good local drunken attempted dead animal resuscitation stories lately. I think this weekend I’ll toss a dead skunk on Carson Street and see if any of the drunk frat boys desperately attempt to revive it with mouth-to-mouth. many, many, many years ago (high school), I went to my very first rock concert…van halen at the arena. my friends and I sat behind these two dudes…we’ll call them beavis and butthead. at the end of the show, as I was getting up out of my seat to leave, I spilled my cup that had formerly housed my coca-cola, knocking a whole bunch of ice down underneath the row of seats in front of us. who said that stoners aren’t ambitious? the only problem with your dead skunk plan is that frat boys are too young to know who pepe le pew is. Now that’s a sad panda. They’ll be hearing from my lawyers too. You could put a live one on Carson and just the smell of the frat boy cologne will be enough to kill it. Seriously, do they really think that cloud of Funk and their shiny shirts are helping the girls to look past their lack of personality??? I try very hard to avoid S.S. for the most part because of these vile creatures (the frat boys & the trash they chase) but sometimes I just can’t help but crave food from the Double Wide or Yo Rita. If we can’t get rid of the stink bugs or the skunks can we at least try to spray for these pests?